TV Guide Magazine: Throughout the season, will you go back to your favorite moments on the show? Winfrey: There will be some of that. We have nearly 5,000 hours [of footage], and we broke up into different teams of people who have over the past eight, nine months looked at every single show. TV Guide Magazine: Wow. Impressive. Winfrey: That's what I say, too. [Laughs] They have reviewed and documented every single show, so we know what to revisit. I plan on going back to Forsyth County [in Georgia]. That's the town where there were no black people allowed and a guy was using the N-word with me. I'm going to do a tour of the new Forsyth County with him. I'm also going to go back to Williamson, West Virginia, where the town wouldn't allow a young man who had AIDS in the grocery store. His name was Michael Sisco. He's since died. V Guide Magazine: Have you asked President Obama to make an appearance? Winfrey: No, I did not ask him to come on this year. But I did say, "I'm sure you will hear from somebody on my team before this year is over." [Laughs] I'm sure that at some point I will see a taped message or something. TV Guide Magazine: Is it true that you're trying to locate the people who were on your first show and in the audience for your first national show? Winfrey: That is true. Our record-keeping wasn't as solid then as it is now. [Laughs] Those were the days when I would go out on the street and ask people to come in: "Come in! It's air-conditioned." TV Guide Magazine: How did Oprah evolve into a show that is about inspiration and aspiration? 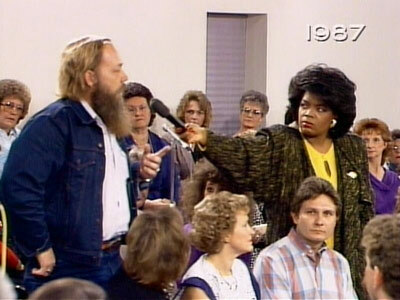 Winfrey: Yesterday I was looking at a skinhead show [we did in 1988], and I said to my staff, "That's the show that caused me to do television differently." What I learned from that is you cannot allow yourself to be a vehicle that promotes the energy of hatred in any form. That was life-changing for me. TV Guide Magazine: Is there a secret to creating a great talk show? Winfrey: The secret is authenticity. The reason people fail is because they're pretending to be something they're not. And even those who are not in alignment with my value system, people like Jerry Springer, he works because he's real. If you can find what the passion is and figure out a way to express that in an authentic and entertaining way, you have a chance at success.